The Westford Historical Society owns and maintains many resources for researchers. In 2008, a large collection of papers and artifacts were donated to the Westford museum by the heirs of William Millet. The collection is referred to as "The Atwood Collection", after Mr. Millet's mother's family. 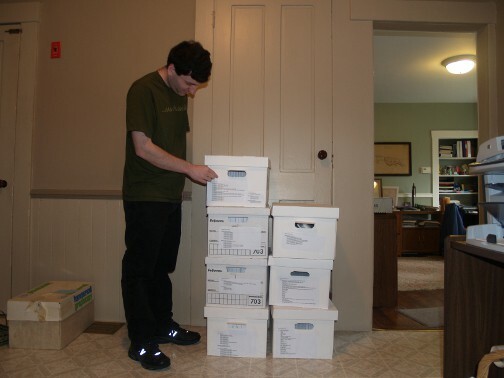 Through the combined effort of many individuals, the papers have been sorted, indexed and boxed in acid-free folders. At left, Museum volunteer Jeff Henry attaches a label to one of the 7 boxes of archives. The paper archives include financial papers, correspondence, probate records, family recipes and professional papers, among others. For more information on the paper archives or other items in the collection, please contact the museum office. In a separate volunteer effort, several of the diaries from Mr. Millet's aunts were transcribed and are available online. A video of artist Bill Millet's story is available on YouTube. A Westford genealogy database is available for lookups in the office. Indices to the Middlesex North Registry of Deeds land records 1629-1855 are available for lookups (bring a thumb drive if you would like a copy). The land records are also available in digital format. Westford Annual Town Reports going back to 1840 are available for lookups and for puchase. Westford historical house summaries include photos, descriptions and some ownership information. Hodgman's The History of Westford is available for lookups and for purchase. It can also be found on GoogleBooks. Listings of Westford vital records are available, and an indexing project is underway. To get copies of the actual records, you must contact the Town Clerk. An Old House Renovation Research Library provides information on historic architecture, colors, interior design, lighting and much more. Street listings back to the 1980s and city directories from the late 18th and early 19th centuries help locate people in town. The Westford Wardsman was published in Turner's Public Spirit from 1906 through 1921. It is available in searchable soft-copy. This contains primarily social and community news from the time period. Excerpts are published weekly in the Westford Eagle under the title A Century Ago. Historical maps from 1730, 1855 and 1875 as well as the current Roudenbush map are available for lookups and for purchase. Photos from the late 19th and early 20th c.
Information on Westford in the American Revolution and subsequent so called "Great Migration"
The Westford Historical Commission is chartered by the Town of Westford with the preservation, protection and development of the historical and archeological assets of the town. For more information, please visit their website. A library of information is available to assist owners in the renovation, restoration or preservation of their older homes. This community resource provides avenues for homeowners to explore the many ideas, methods, suppliers and products available to help retain or bring back the period charm that makes old houses so special. The Resource includes internet site listings, books, vendor catalogs, relevant magazines, and some local business descriptions. This information is available at the Museum Cottage and can be signed out by users. The Museum Cottage office is located adjacent to Westford Museum at 4 Boston Road. The hours are M/W/F from 9AM-1PM. The office can be reached at 978-692-5550. This town site has a searchable index of Westford's Military Honor Roll. The town also has a searchable index of veteran burials in Westford. This town site has a searchable index of fire fighters buried in Westford cemeteries. The 100th Anniversary of Westford's Civil War Monument Dedication was marked in May of 2010. View the history here. 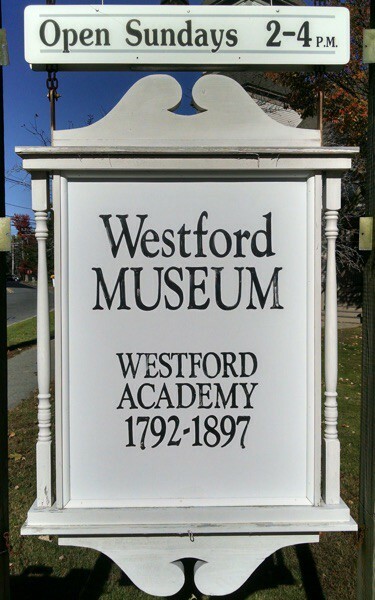 The Westford Historical Society maintains a database of students and faculty who entered Westford Academy from 1792 through 1895. The Westford Colonial Minutemen are a group that enjoys bringing the 18th century heritage of Westford, Massachusetts to the 21st century through local events such as educational programs, parades and reenactments. In addition, we maintain an ongoing database of students who graduated from 1896 through the present. Please contact the Museum office if you would like a lookup from either of these databases. If you're looking for something else related to Westford's history, please contact us.